From 1972-1978, Conrad operated its' business: Conrad was a chain of hardware stores in Chicago, IL., a brand of David Wexler Co., and made by Kasuga, Japan. 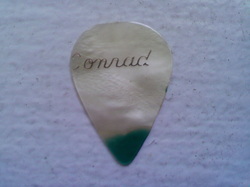 Conrad guitars are said to be very similar to Aria brand guitars. The following Conrad guitar picks have an obvious D'Andrea flair to them! !